Applications: For holding grip (loop) backed abrasive discs. For use on rotary sanding machines and polishers with standard M14 spindles. Not suitable for DA (Dual Action) sanders - see here. Product Notes: Medium (M) hardness pads have a min of 12mm foam interface which helps keep an even pressure on flat surfaces. Hard (H) grade pads have no foam interface and may be more suitable when using coarser grade discs or when shaping wood or metal. Also Available: We also stock backing pads for DA sanders. A range of velcro backed abrasive discs with or without holes is stocked in 125mm and 150mm diameters. 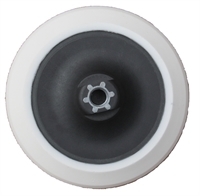 For Trizact and Ceramic FX87GR grip discs we recommend VEL type backing pads.